Equality Illinois will be adopting a new strategic plan effective July 1, 2017 that will outline our civil rights agenda for the upcoming 4 years. 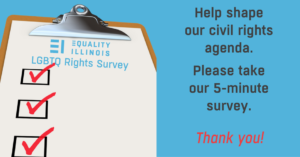 In order to make sure our agenda is most reflective of the diverse viewpoints of the LGBTQ and allied community in Illinois, we need your input. Please take a few minutes to fill out the online survey. Not only will you have a chance to inform our civil rights agenda, but every week 2 people who complete the survey will win a $50 American Express gift card.